Long term development of the Building Cost Index. Source: Building cost index. Statistics Finland. 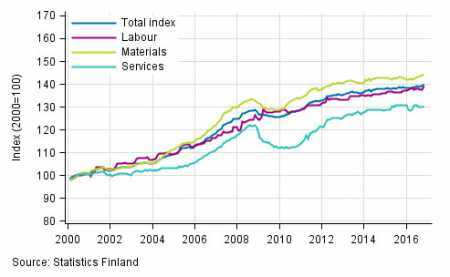 Building costs rose by one per cent year-on-year in October 2016, according to Statistics Finland’s data. The prices of labour inputs in construction went up by 1.5 per cent and the prices of materials by one per cent from one year ago. At the same time, the prices of services went down by 0.4 per cent, the statistics show. The total index of building costs rose by 0.5 per cent From September to October. The prices of labour inputs rose by one per cent from the previous month while the prices of materials by 0.1 per cent in a month and the prices of services by 0.4 per cent. Source: Building cost index. Statistics Finland.